For this live, demonstrative performance painting project, I painted in Old Town Square, Fort Collins. A summer calendar of days I would be working was promoted and allowed local patrons to schedule visits to witness the development of the project. My “targeted paint” application of painting is both entertaining and functional. The highly textured paint application is fun for pedestrians to watch while it is applied and deters graffiti. I had many visitors that summer in my pseudo-painting studio where they could watch the creative process 4 days a week. The 10 steel mural panels created in public view are installed vertically on cast concrete pedestals and spaced 5’ apart. 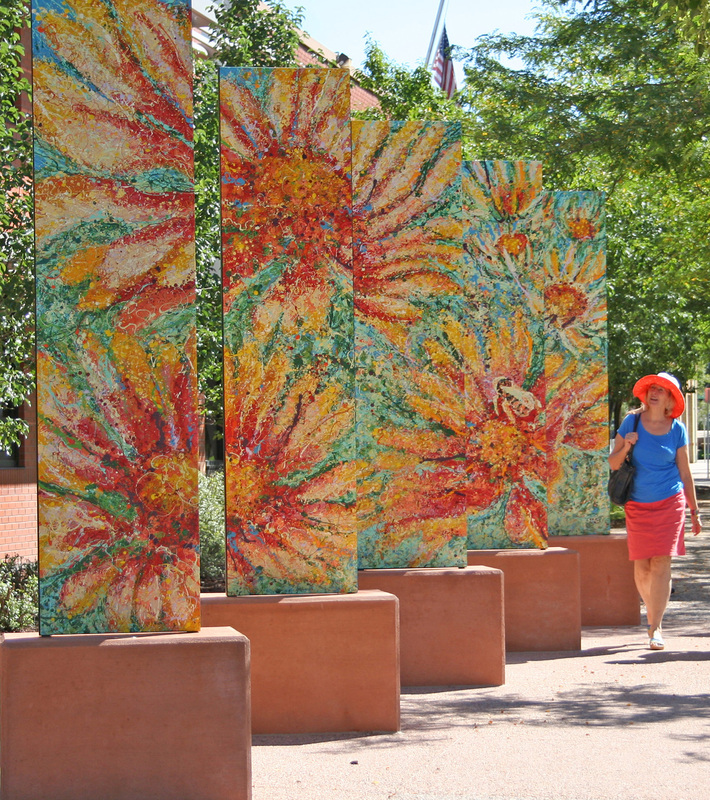 Walking between, each panel becomes a 10’T x 2‘W flag of abstract color. Approaching from the north 5 panels combined visually form a field of Blanket Flowers. Approaching from the south, the reverse set of panels form Ponderosa Pine Cones. Up lighting projects from the concrete bases.